I need your help please - which layout? Thread: I need your help please - which layout? ​Both look nice but my favourite is # 2. He will love either one. They are both so very pretty. It is just in a high key, as they say. I love it. You still have light, medium, and darks. Go with it. I preferred the second layout. It seemed like the colors were better defined. Either way is beautiful and relaxing. I like number 1 best. Good job! Your fabric is fine, just more subdued. I know there is probably a technical term for that. I like #2 as it is a bit different then the more standard rail fence layout. They are both really lovely! I like the calming "feel" of the blending fabrics too. #1 is most appealing to me! 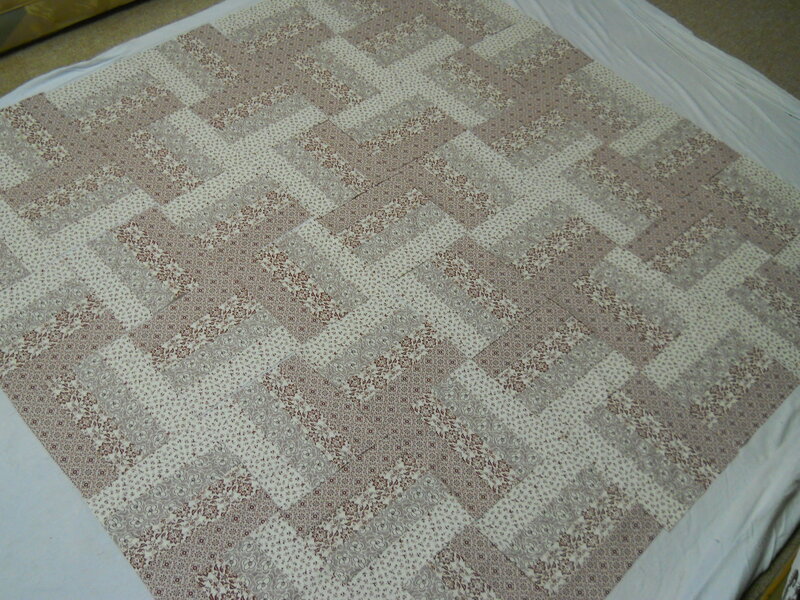 I like the lightness of your quilt. I think it really has an elegant look to it. As azwendyg said, it has a very calming feel to it. Nice job! Tough choice -- I like them both! To me, #1 is quieter, #2 more dramatic. Your fabric choices are fine -- it's a quilt to make a person smile. I love your fabric choices. Either layout is great! Very nice gift! I like them both, but I like the rail fence #1 better. I like your fabric choices very much.....and like #1 best. As has been said, very calming and relaxing! I think he'll love it! I quite like the first one, as a traditional rail fence. If you want some more zip to it ... choose a backing that coordinates, but has a little more punch. It would be like giving him two quilts to enjoy!! Think at is a great choice of colors for a man. look lay out # 2. I think number two option and a darker border would look great. Beautiful quilt. Not all quilts have to shout. Some just quietly hum, like this one. Very nice! I think the first one has a more masculine feel - JMHO. I like the first one. If you are looking for more contrast, you could add a medium to darker brown strip to the outside edges and flip flop them like in the first photo. If not, maybe a darker border or darker binding. Now that I suggested that, I think you have to be sure if you do, they still end up square. It might not work that way. If not, maybe a sashing? and that is why I choose # 1 - your fabrics are quiet too, so the quiet design supports the color. Put a dark brown border on it and it will be beautiful! I vote for #1. 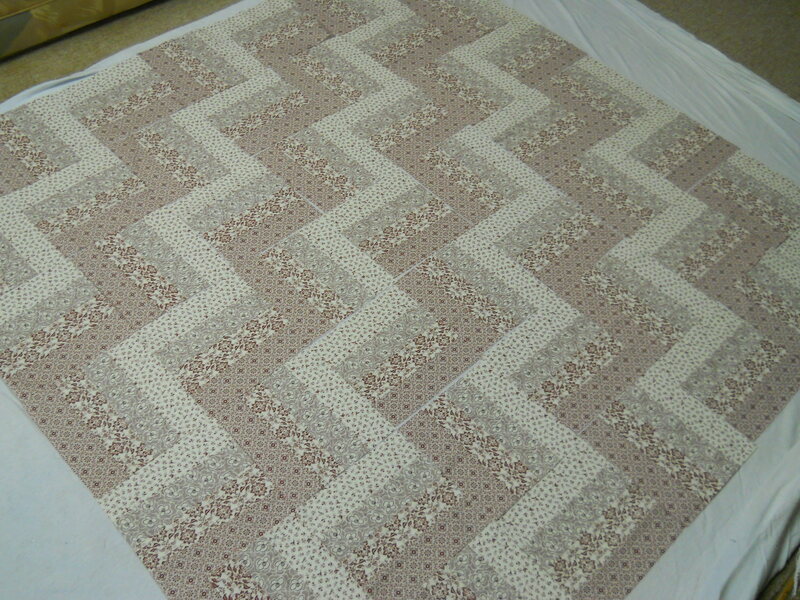 Lovely quilt by the way. Great job. I like no. 1 and if it were mine, a calm border or even none and a bright yellow, red, green or royal blue binding. My vote goes for layout #1. I love your soft colors. Looks lovely.